San Cristobal de las Casas is located in the central highlands of Chiapas. The city is located at 2,100 metres and is named after Bartolome De Las Casas who was a Spanish priest that defended the rights of Indigenous people and was the states first bishop. The city is the third largest city in Chiapas with a population of around 140,000 people. The city has a wonderful colonial feel and the nearby Mayan ruins are stunning. For many millennia many different Mayan peoples inhabited the area around the city. In 1528 the Spanish took over area made the city the capital, which was later moved. Since this time there has been on going tension between the Spanish population and the Mayan population. Most recently this exploded in the Zapatista conflict, when the Zapatista Army of National Liberation actually took over the city in January 1994. The conflict has settled down and the city is safe to visit, even though the Zapatistas are present in the markets and other parts of town. Palenque Ruin is an ancient Mayan city located only a 30-minute drive away from town. Templo de Santo Domingo Guzmán, 20 de Noviembre s/n. Daily. Built in the mid-16th century, this is the most notable of San Cristóbal's many churches. The Baroque façade is a mix of Oaxacan and Guatemalan styles, and the ornate interior is richly gilded. The interior is especially beautiful in the evening with candlelight. Free. Museo de los Altos de Chiapas (Exconvento Santo Domingo de Guzmán), 20 de Noviembre s/n (Barrio El Cerrillo), ☎ +52 967 678 2809. Tu-Su 09:00-18:00. Housed in the former convent, this museum displays artifacts illustrating the history of Chiapas and the region. On the first floor is the Centro de Textiles del Mundo Maya, also known as the Francesco Pellizzi Collection, a remarkable collection of historic and contemporary Mayan textiles from Chiapas and Guatemala. M$48. Museo de la Medicina Maya (Maya Medicine Museum), Calz Salomón González Blanco 10 (Col Morelos), ☎ +52 967 678 5438, fax: +52 967 678 5438, e-mail: omiech@prodigy.net.mx. M-F 10:00-18:00, Sa Su 10:00-16:00. Not to be missed, this museum is operated by a collective of indigenous healers and herbalists. Information is available in English and Spanish and there are also healers on site to treat whatever ailment you may suffer. M$25. Museo Na Bolom, Av Vicente Guerrero 33 (Barrio El Cerrillo), ☎ +52 967 678 1418, e-mail: presidencia@nabolom.org. Tu-Su 09:00-20:00. The former home of Swiss anthropologist/photographer Gertrudis Duby Blom, the wife of Danish archeologist Frans Blom, continues to be an inn and museum managed by her supporters and associates. The museum also includes an extensive library of research on the Maya. M$45 (adults), M$25 (concessions). Museo del Ámbar (Amber Museum), Diego de Mazariegos s/n (in the Convento de la Merced), ☎ +52 967 678 9716, fax: +52 967 678 0310, e-mail: info@museodelambar.com.mx. Tu-Su 10:00-14:00, 16:00-19:30. Housed in a former convent, this small museum displays more than 300 specimens of amber, and also offers some beautiful pieces for sale. This is a good place to visit if you intend to purchase amber in Chiapas, as staff can explain how to identify real vs. fake amber: real amber is always warm to the touch, and emits a faint resin smell when rubbed. M$20. Museo Mesoamericano del Jade (La Casa del Jade), Ave 16 de Septiembre 16, ☎ +52 967 678 1121, fax: +52 967 678 3145, e-mail: info@eljade.com. M-Sa 12:00-20:00. This small museum displays ancient jade artifacts and jewelry, and sells high-quality contemporary pieces. M$30 (adults), M$15 (students). Templo de Guadalupe (Cerro de Guadalupe). Situated up a long flight of stairs on a hill to the west of town, this church itself is not especially noteworthy but does offer good views of the town. This area is not safe after dark, and even during the day solo women may be harassed. Templo de San Cristóbal (Derro de San Cristóbal). Located on a hill to the east of town, this church offers good views of the town below. This area is also not safe after dark. Orquídeas Moxviquil, Periférico Norte 4, ☎ +52 967 678 5727. M-Sa 09:00-17:00, Su 10:00-16:00. Established in 1994, this garden grows orchids and other plants rescued from nearby areas undergoing deforestation, and is dedicated to preserving and displaying all varieties of orchids native to the state of Chiapas. Nearby, on property owned by the gardens, is the unexcavated Mayan site of Moxviquil. All that remains of the structures are the foundations, which can be reached via a short hiking trail beginning from the garden area. The gardens are best visited in the spring beginning in April, when most of the orchids are in bloom. M$30 (gardens only), M$50 (gardens + archaeological site). Although the Day of the Dead is also celebrated in many Latin American countries except Mexico (and also in parts of Europe, Asia and Africa), the Day of the Dead (Spanish: Día de los Muertos) is most intensily celebrated in Mexciowhere where it is equal to a National Holiday. The holiday focuses on gatherings of family and friends to pray for and remember friends and family members who have died. The celebration takes place on November 1st and 2nd, in connection with the Catholic holidays of All Saints' Day (November 1) and All Souls' Day (November 2). Traditions connected with the holiday include building private altars honoring the deceased using sugar skulls, marigolds, and the favorite foods and beverages of the departed and visiting graves with these as gifts. Although it is about the Dead, it is also a celebration where eating and partying both are common as well. Grito de la Independencia - September 15th is Mexican Independence Day! A massive celebration involving plenty of singing, dancing and fireworks takes place in the Zócalo. Everyone here awaits an appearance from Mexico's president who rings a bell from a central balcony of the Palacio Nacional overlooking the Zócalo. The president then shouts out the Grito de Dolores, or the Cry of Dolores which was Father Hidalgo's famous call to arms against Spanish rule in 1810. Because of its altitude it rarely gets really warm in San Cristobal de las Casas. The warmest time is during the summer months from May to September. From November to February nights can get pretty cold, so bring warm clothes. In the summer high temperatures tend to be around 25 °C with lows averaging about 10-11 °C, while in winter temperatures can range from 4°-20°, with lows occasionally dropping below 0 °C. Tuxtla Gutiérrez is the nearest airport with regular passenger flights. The fare for a taxi is M$600 per taxi to San Cristóbal and M$200 to Tuxtla, or a shuttle service offering door-to-door service for M$170 to/from San Cristóbal. The express bus system for getting around Mexico is advanced. The buses are generally comfortable and clean and there are multiple lines to choose from in a user-friendly way with professional and helpful ticket clerks at most main stations. For Guatemala, most agencies offer daily van service to Quetzaltenango (eight hours), Panajachel (10 hours), Antigua (12 hours) and Flores (via Palenque). There are many other public transportation modes from Tuxtla to San Cristóbal: taxi, colectivo, autobus, and collective suburbans. The taxi drivers all know where these are located. Colectivos (on the Pan-American Highway, 24hrs) to/from Tuxtla Gutierrez, Ocosingo, Comitán, and Palenque all operate from depots located just south of the bus station. From Tuxtla one can take an Ómnibus de Chiapas that leaves every 20 minutes to San Cristóbal for about $40 MXN. If you are reasonably mobile you should be able to walk anywhere within the city without strain. Bicycles are also a good way to get around if you have a very adventurous side! Taxis are all over the place (a little too many of them, honestly) and easy to flag down. Rates are negotiable, and are generally M$30-40; after 22:00 fares go up by M$5. Ask the price before getting in to make sure that you get the going rate. Note: Because of a number of assaults by drivers, solo women are strongly advised to avoid hailing taxis on the street after dark. It is best to call for one or have one called for you. The main form of public transportation for locals come in the form of a van or minibus. Colectivos run fixed routes, with destinations painted on the windshield. Passengers can be picked up or dropped of any point along the route for a fare of M$6. Be prepared for a cramped ride and frequent stops but hey, that's just part of the fun. On and around the main square there are many sit-down restaurants. You can find cheaper food at the local street vendors and at the markets. Go to the main public market and eat tamales for breakfast. Another local specialty is sopa de pan which you will probably not find in any restaurant catering to tourists. You will find it in the comedors in the market. That is the best food in town. On Saturdays many houses sell tamales out their front door. Look for the red lights. On any given evening there are places where people make antojitos on the street in front of their houses. This is real local food. At certain times of the year different exotic insects are consumed in different ways. Pay attention in the market and you might have the chance to try something really exotic. A lunch time bargain is in the different cantinas. These are family places: order a beer and you will get a little plate of food to go with it - house choice. It's cheap and excellent, though, you might get drunk in the process. Almost all restaurants serve filtered water. The local drink here is "posh" or pox. It is a hard liquor made from cane and has been used traditionally for healing and partying. It is frequently served in ponche – a pineapple or fruit hot punch with a special bread broken into it. In recent years hostels, B & B's, hotels and resorts have seemed to explode across San Cristobal. It is possible to find any kind of accommodation for any kind of budget in this town now. Remember that many places can fill up during the high season so it might be wise to book in advance. Some of the more budget places can get cold in the winter because of the lack of heating. Posada Ganesha is a chill yoga theme hostel located near the city centre. The central courtyard is decorated with Hindu and Mexican fusion art and the common areas around the back courtyard are very nice. Dorms are 100 pesos per bed and private rooms range from 200 pesos to 400 pesos depending on the number of beds. This is a great place and relax while enjoying San Cristobal. The friendly staff also sell tours to nearby areas. Hot water is 24 hours but has to be requested. The hostel is located at calle 28 de Agosto #23, phone: 678-02-12. Posada Mexico is an IH hostel located around a central courtyard. It has a good view and has dorms starting at 70 pesos a night. During the evenings this place can get a little wild. Internet and breakfast is included in the rent. Posada Mexico is located at Josefa Ortiz de Dominguez #12, phone: 678-00-14. Internet cafe's are widely available and you generally can find one in the direct vicinity. Sometimes photocopy stores or photo processing stores will double as an internet cafe with a couple of computers. Look for signs reading "Acceso a Internet" or "Cibernautica" or "Cibercafe". Charges range from approx. US$1 an hour to US$3 an hour, depending on the location. Phone cards can be purchased anywhere and are needed for the majority of public phones. To call any number outside your region you have to dial 01 then followed by the area code. If calling a cellphone from a normal phone start with with 044. If calling cellphone to cellphone just dial the 10-digit number. To make an international call dial 00 followed by the country code then the local number. To call to Mexico, also dial 00 (most of the times) followed by the national code 52. The Mexican postal service is operated by Correos de México. The post service in Mexico is pretty good although not very cheap. It is reliable regarding the sending of postcards, but it takes at least a week to send it to other countries (US/Canada), more so if you send it to Europe or Australia. For packages it is better to use international services like FedEx or UPS. If you are sending a package internationally with the Mexican postal service, take the package OPEN to the post office, they may want to inspect it. Seal it up at the post office. Post offices typically open from 8:00am to 6:00pm Monday to Friday, and 9:00am to 1:00pm Saturday. You will find post offices (Oficina de Correos) is almost any town or city in Mexico. To buy stamps it is best to go to the post office, although you can also get them at stamp machines, located outside the post offices, at bus stations, airports and some commercial establishments. 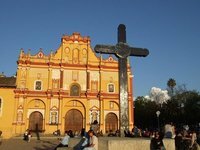 We have a comprehensive list of accommodation in San Cristobal de las Casas searchable right here on Travellerspoint. You can use our map to quickly compare budget, mid-range or top of the range accommodation in San Cristobal de las Casas and areas nearby. This is version 16. Last edited at 8:13 on Apr 19, 19 by Utrecht. 4 articles link to this page.